A deadly combination these two are….I mean it really is the best of both worlds. 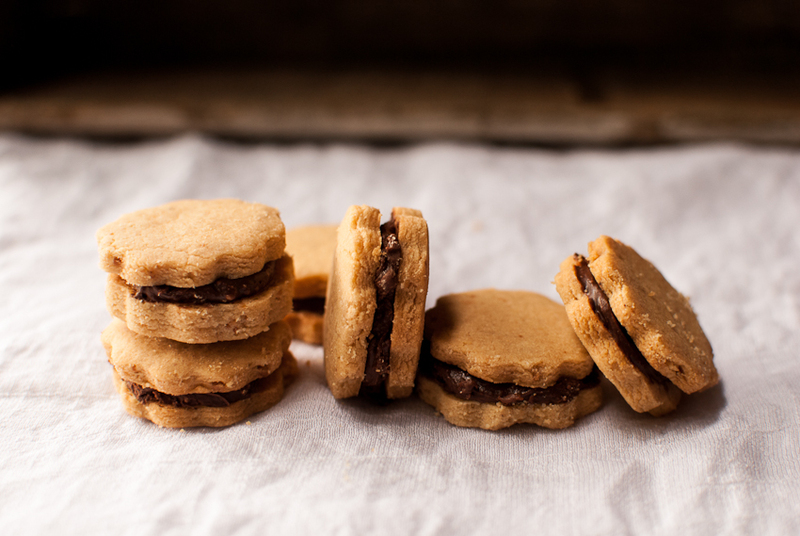 Salty, creamy, peanut butter with smooth, rich, chocolate… how can you NOT like these two together?! Sometime you just have to do it, jump all in and worry about the consequences later, like eating a dozen of these all at once! I do not recommend this, but hey I won’t judge! I have been called a “food snob” on more than one occasion…as I’ve become older and wiser, there are some foods that just will not do! I am picky on what calories go into this aging body, I will not do fast food!! I stay far away from chain restaurants also. When I can cook the same dish better and know what is going into it, then I do so. Besides, I love to cook, yes I actually miss cooking when on vaca in a far away land. By the 4th day I’m craving my kitchen and culinary tools! But, I will indulge in a great dinner out with my sweetie! We are very spoiled in Portland to have such an amazing food scene here. Maybe that’s another reason why I’m a “food snob”… so they say?! 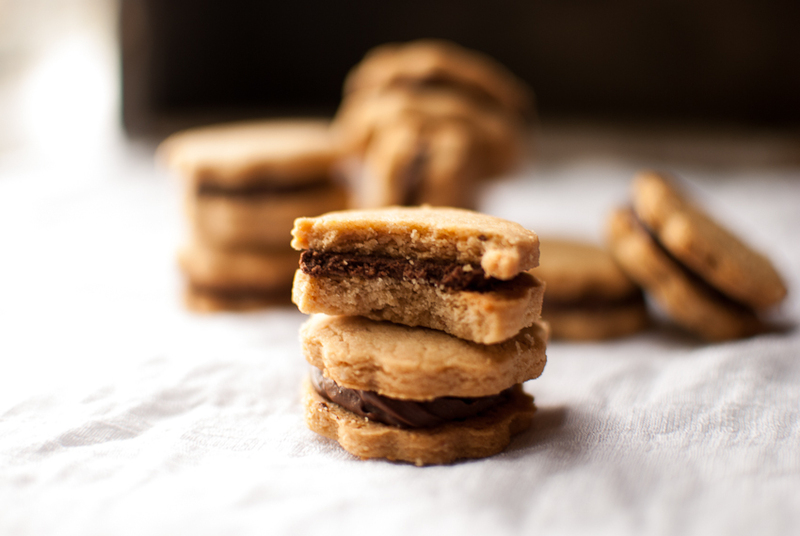 So for these peanut butter sandwich cookies, you must, I mean must use a natural peanut butter. Make your own or use the peanut machine in the organic isle at the grocery store. For one, it’s better for you, and two, tastes amaaaaazing! It’s super creamy and not to sweet on it’s own. I spread mine on celery all the time. These remind me of my childhood cookies, the one’s made by Mother’s. No not my mother, but the brand Mother’s :) You know the sandwich cookies with the creamy filling. My mother fed me lots of processed crap when I was young, I think that’s just how they lived back then, the time of quick and easy! In a large mixing bowl, beat butter until light and fluffy, then add the peanut butter and beat until smooth. Add sugars and mix until combined, next add the egg and mix at medium until smooth. In a medium bowl, whisk dry ingredients until combined. Add the dry to the wet, and mix on low. Thew dough should be thick and a somewhat crumbly. Divide into two equal parts and wrap in plastic wrap. Place in fridge for at least an hour, until chilled and firm. Line two sheets with parchment paper. Roll out dough, one section at a time. This takes patience, it will want to crumble on you, just keep patting the edges together and slowly roll out to 1/4 inch thickness. Using any small cutter you have, 2 inches or smaller, cut cookies and place on a parchment lined cookie sheet. Re-roll the dough scraps until all dough is used and cut into shapes. Bake for 12 minutes, until lightly golden brown and slightly puffed. While cookies cool, make the filling. In a double broiler or a bowl set over the top of boiling water, combine the chocolate, peanut butter, butter and salt. Let filling cool until spreadable. 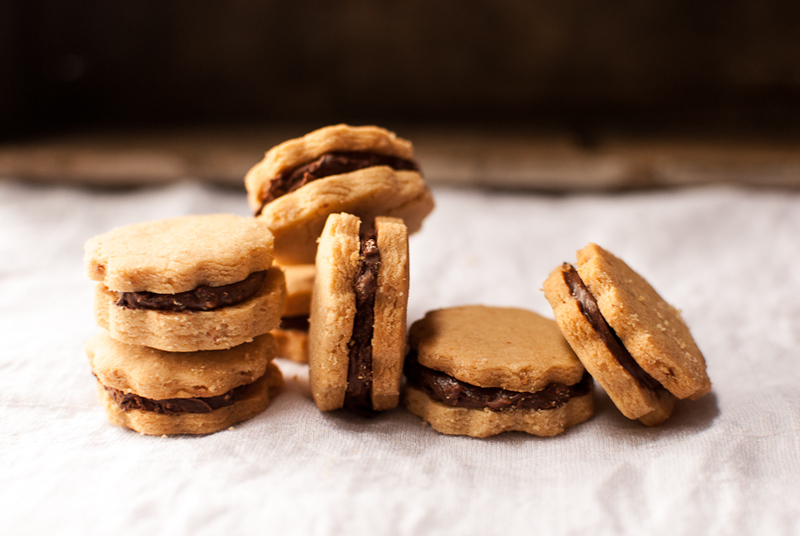 To fill the cookies, you can pipe the filling onto the cookie, or using a small knife, spread the filling on the cookie and sandwich together with another cookie. Makes about 40-50 cookies depending on your size of cookie cutter. Try to eat only a few and enjoy! Yum these look amazing! My problem would be I wouldn’t be able to stop at a few!